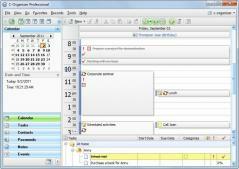 C-Organizer Pro is a comprehensive personal information manager that includes a planner, notes, a contacts list, a password manager and events calendar. The application enables you to plan your day, schedule meetings and events, store contacts, jot down notes and idea, as well as securely store your passwords. C-Organizer Pro lets you share data in real-time on a network, but also sync it with Google Contacts, Google Calendar, and Google Tasks. On top of that, the application can be used to securely store bookmarks and contacts, and provides support for photos and rich text format among others.